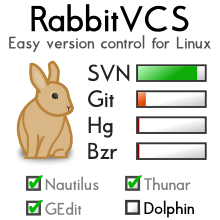 RabbitVCS is a collection of graphical tools providing simple and straightforward access to version control systems from interfaces you already use. RabbitVCS is primarily inspired by TortoiseSVN. It is free/libre/open-source software written in Python using the PyGObject library (formerly PyGTK).